ST. CLAIRSVILLE — The old saying is âdefense wins championships. That was true for Beallsville during Saturday’s Wheeling Hospital OVAC Girls Basketball Championships at Ohio University-Eastern. Beallsville held Madonna to one of its lowest outputs of the season, defeating the Blue Dons, 38-33, to claim an OVAC Class 1A championship. The victory is the school’s first since current coach Tori Jarrett’s squad won it in 2010. 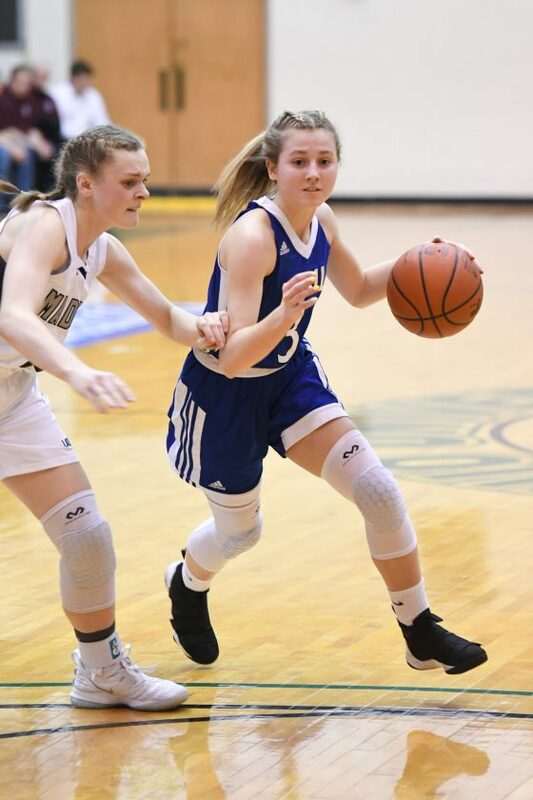 That team, coached by her father, Terry, makes the Jarretts the first father-daughter combination to win OVAC championship in girls basketball. Terry is currently an assistant on the team. “I thought we played really good defense and made our foul shots at the end,” Tori Jarrett said. “They had me a little nervous, but I had 100 percent faith in our team. We came out and executed our game plan exactly. I knew they (Madonna) were going to go on some runs because they are a really good team. Beallsville (17-3) held Madonna to 29 percent shooting on 13 of 45. Senior standout Andrea Alimario finished with a team-high 16 points for the Blue Dons, but the Blue Devils held her to two in the first half. Despite Madonna’s lack of offense, it was able to keep Beallsville from blowing the game open. Beallsville’s largest lead was six points (22-16 in the third quarter). The Blue Dons (16-5) tied it early in the fourth at 24-24 and got within one twice, but could never take the lead. Ashley Howell, who paced the Blue Devils with 16 points, drained a 3-pointer to push the lead to two scores at 30-26 with 3:42 left. With 1:27 to go, Madonna’s Kennedy Martin scored underneath to bring the Blue Dons within 30-28. For the Blue Devils, it then became a free-throw shooting contest and one they were more than ready to handle. Beallsville went 8-for-10 from the free-throw line down the stretch — 11 of 14 in the fourth quarter as Howell’s 3-pointer was the lone field goal for the Blue Devils during the final eight minutes. An Alimario 3 kept Madonna’s hopes alive at 34-33 with 15 seconds remaining. Olivia Muncy was fouled and true on her two shots. Madonna had one final chance, but the inbounds pass was intercepted by Beallsville’s Ashlie Louden, who was fouled immediately. Her free throw sealed a championship for the Blue Devils. Louden scored eight points, but her all-around effort on both sides of the ball earned her the John Howell Most Valuable Player Award. “You come down here in this great environment, you work for it all year and if anybody watched the game, they saw the two best Single A teams in the OVAC,” Madonna coach Rodney Boniti said. “We knew Beallsville was well-coached, extremely disciplined and my hats off to them. They hit the shots when they had to. Unfortunately, we couldn’t get the ball to drop (Saturday).